Which social media notification do you check first? We found that millennials are checking Snapchat before Facebook, Instagram, and LinkedIn… combined. Snap Inc., parent company of messaging app Snapchat, has been the word on Wall Street since it went public on March 2nd. Following in the footsteps of social media giants Facebook and Twitter, Snap rode its immense popularity to produce eye-popping numbers during its initial offering, with a first day closing price at $24.53. At the end of trading Snap was up 44% and had a public market capitalization of $28.4 billion. The company had priced shares at $17 to raise $3.4 billion. In the days following the IPO, shares of Snap traded lower as exuberance and volume settled. On Wednesday March 15th, Snap shares closed at $20.77. This performance marked Snapchat’s parent company’s fifth straight session of declines. Investors and analysts alike cite Snap’s slowing user growth, expanding losses, and lack of voting rights for outside investors as the reasons for the decaying excitement in the stock. While the momentum for Snap has slowed tremendously, there is still plenty of optimism to be found. Checking Snapchat has become a ritualistic occurrence for most millennials, a demographic coveted by nearly every single company in existence today. Additionally, according to new data gathered by LendEDU, Snapchat is the leader amongst social media competitors in an interesting statistic. This data point should be welcomed news for Snap and it’s investors. 58% of college students, an extremely valuable demographic, check Snapchat over Facebook, Instagram, and LinkedIn combined. Instagram accounted for 27%, Facebook for 13%, and LinkedIn for 2%, or a total of 42%. This is a huge selling point that Snap can make to companies thinking about advertising through Snapchat. Consumers are more than four times more likely to open a push notification from Snapchat than they are from Facebook. 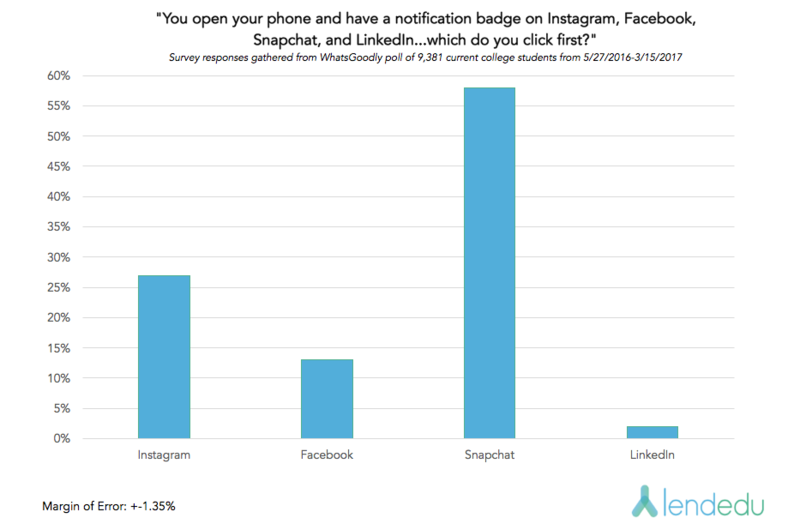 When Facebook is substituted for Instagram, users are still two times more likely to open a Snapchat notification. This statistic acknowledges the value that the younger generations have placed on Snapchat. According to this data, millennials are more curious as to what is happening on their Snapchat than any other social media platform. Considering both the quickening pace and shortening attention span of modern society, companies will have a much higher chance at successfully advertising their products with Snapchat than with any other social media outlet. Facebook is considered the gold standard for tech-startups looking to go public. Similar to Snap, Facebook’s high flying first day on the market was followed by weeks of severe underperformance and disappointment. Today, Facebook trades at $139.68 and has become a popular stock in many portfolios. How does Snap stack up to Facebook? Facebook boasts 1.8 billion monthly active users, while Snap only has roughly 158 million active users. Since almost all of their revenue stems from advertising, user growth will be critical to Snap. For reference, Twitter currently has about 319 million monthly active users. For companies looking to push their products on millennials, Snap could be a huge platform. According to Snap, the majority of Snapchat users are aged 18-to-34 years old; on average, these users visit the app 18 times a day for a combined 25 to 30 minutes. Additionally, users younger than 25 visit the application more than 20 times a day for more than 30 minutes. If one combines the above statistics with LendEDU’s data, Snap may not only survive the volatile Wall Street environment, but prosper. The company’s user quantity may not be overly impressive, but Snap’s user quality is where the value can be found. As many companies struggle to develop a strategy that will attract millennials, Snap already has this demographic flocking to their product. Overall, Snap’s access and importance to millennials will be the driving force behind their success in the stock market.